Lil’ Chef School is located within the Irvine Village Shopping Center, on the corner of Irvine Center Drive and Jeffrey Road in the BACK of the main strip mall where truck deliveries park and unload. We are behind Supreme Fitness in Suite 132. We are seeking an outgoing and fun individual to join our team. 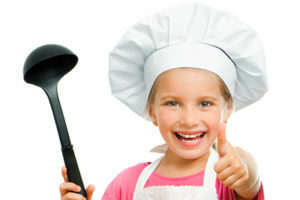 We need someone who loves to cook and can teach children a recipe. A basic culinary background is preferred. Experience with children a must. Strong communication skills required to teach classes for all ages. Ability to act silly and perform a skit in front of children and their parents. Need to be available to work weekdays, nights, weekends and holidays. CPR certificate needed. Need vehicle with proof of insurance to drive to schools for after school cooking programs. Background check/fingerprinting is required thru Life Scan.